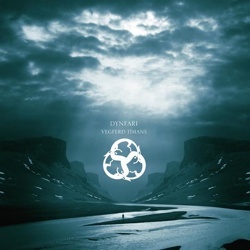 Icelandic atmospheric black metal band Dynfari has revealed the first details of its upcoming full-length album “Vegferð Tímans“, scheduled for a March 2015 release on Aural Music / Code666 Records. After almost three years of writing and composing, recording and re-recording, producing and mixing, Dynfari will soon finally let you enjoy the fruit of their labour, the 56-minute “Journey of Time”. The band has just unveiled the cover artwork created by Metastazis, as well as the album tracklist. Some of these 8 songs have been a staple of their live set-list for the past 2 years or so. A single from ”Vegferð Tímans” is planned to be online in January 2015, along with more exciting news. Wow, this artwork looks cool. I will check them out ! It is cool. Especially if you see it full-size!